Long, long ago, in a far away land, lived a King and Queen. Many years they had longed for a child and finally their wish was granted. A daughter was born and was to be called Aurora. But the king so loved his lovely child, he called her ? Beauty. A great holiday was proclaimed throughout the kingdom and everyone, including the Fairies came to pay homage. The Fairies bestowed the gifts of Goodness, Grace, Charity and Love on the child. The evil Fairy Carabosse, – who has not been invited ? appears and puts a curse upon Beauty, that before her eighteenth birthday she shall prick her finger on a Spinning Wheel and die. Many sad and lonely years pass by until Carabosse does indeed trick Beauty into pricking her finger on a Spinning Wheel and she dies. The Good Fairy Rosebud is able to reverse the curse, and sends Beauty and the entire Court into a deep sleep. She can only be awakened by the tender kiss of the handsome Prince she had earlier met in the forest. An enchanting and exciting tale for the whole family. Highlighted by the antics of Dame Dotty Diddley Doo, and the Court Jester, Silly Billy.With singing , dancing, comedy, and music. Together with sparkling sets and costumes. Everything you have come to expect from the traditional family panto at the Garrick Playhouse. 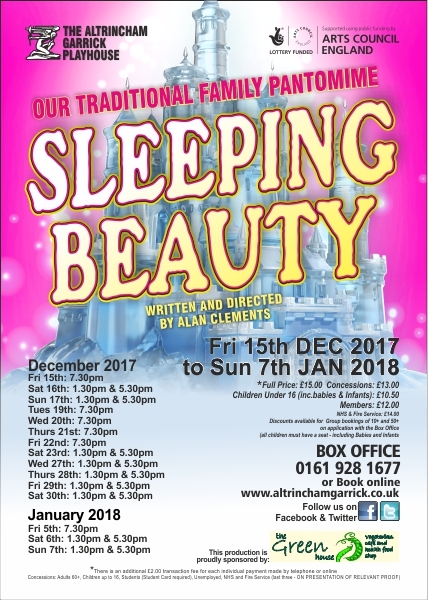 YOU know that any panto written and directed by Alan Clements will be a good one and Sleeping Beauty at the Garrick is no exception. Don?t sit on the front row. Dave, a member of the audience, made that mistake and ended up with the Dame, Nurse Dotty Diddly Doo testing him with a stethoscope! The Dame, played by Steve Connolly and Silly Billy (Liam Dodd), described as ?One magic wand short of a spell ? skilfully dance around a balloon. There are 12 real dancers too. They excel in the Land of Dreams scene. The story is about a King and Queen, who after many childless years, have a baby daughter, Beauty. Sadly the Queen dies but the King (Dave Midgely) perks up for the Christening Party. The fairies bestow the child with Goodness, Grace, Charity and Love. When the uninvited fairy, Carabosse, appears, she curses the Princess saying that on her 18th birthday, Beauty will prick her finger on a spinning wheel and die. Good Fairy Rosebud changes this by predicting the Princess and the Court will just fall asleep until a Prince kisses Beauty awake. Both the fairies are outstanding. Beverley Stuart-Cole?s Fairy Rosebud is seldom off stage as she waves her wand for good. Hannah Williams, a force for evil, gets her share of boos. Prince Florizel (Olivia Callaghan) and Princess Beauty (Lara Hancox) sing a lovely duet and, later, all ends happily. This is a family panto ? no smutty jokes ? and Mike Shaw and his team?s costumes add to the effect. Save Money on your tickets…. Membership of the theatre entitles you to tickets at greatly reduced prices as well as access to the bar during non show weeks together with regular news and updates of other Garrick events throughout the season. If you are thinking of booking for just 3 of our productions this season, on our main stage, (that’s 3 pairs of tickets) you could save the cost of your full season’s membership! Membership also shows your support for the theatre and can also open a whole new world for you ? we are always looking for new talent, any age, to work in all areas of the theatre ? no experience is necessary as you will be given full training by our qualified staff. We promise you that the satisfaction of a job well done, will really surprise you, as well as new friends waiting to meet you. Please pick up an Application form from the Box Office or write to the Membership secretary, at the theatre.